Battling the Balanced Encounter: The advantages and disadvantages thereof. Shamanism, the Agnostic Faith: Playing classical Shamans, and why they make near-ideal characters. Cliff Notes for the 1940’s: how to make a 1940’s-1950’s setting convincing. Baba Yaga the Exaltation – adapting rules to your own needs. Features of Victorian Settings: the basic characteristics of a Victorian-style world. 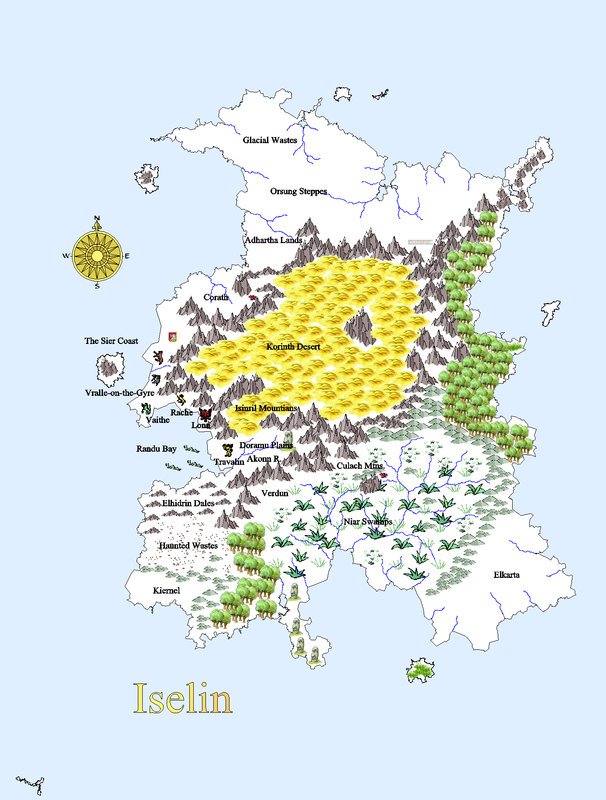 The World of Iselin: A quick d20 campaign setting. The map is linked both in the post and here, for your convenience. Sample Eclipse: The Codex Persona Classless Point-Buy Characters: Ragnar the Questionable (a warrior of illusion), Black Marty (a pirate-captian power package or “Identity”), Eleven more Identities/Power Packages (From Kevin Sanwell – as Knight of Faerie, Roman Lordling, Sorcerer Antihero, Victorian Spy, Demon, Eccentric Hedge Wizard, Werewolf, Red Wizard, Gray Jedi/Sith Force User, Anime Swordsman, and Dragonfire Master), plus two absurdly overpowered identities for him (Ailill the Dragon and Lord of Kadia). Offsite, we have a couple of Identities for Limey the Sentient Laptop. Federation-Apocalypse Campaign Log: Session 50, Session 51, and Session 52. New Schools: The Taimushifuto Mugen (Timewarping Dream) Courtier School, Munashii Ji / Volgaren Merenae Void Manipulation Courtier School. 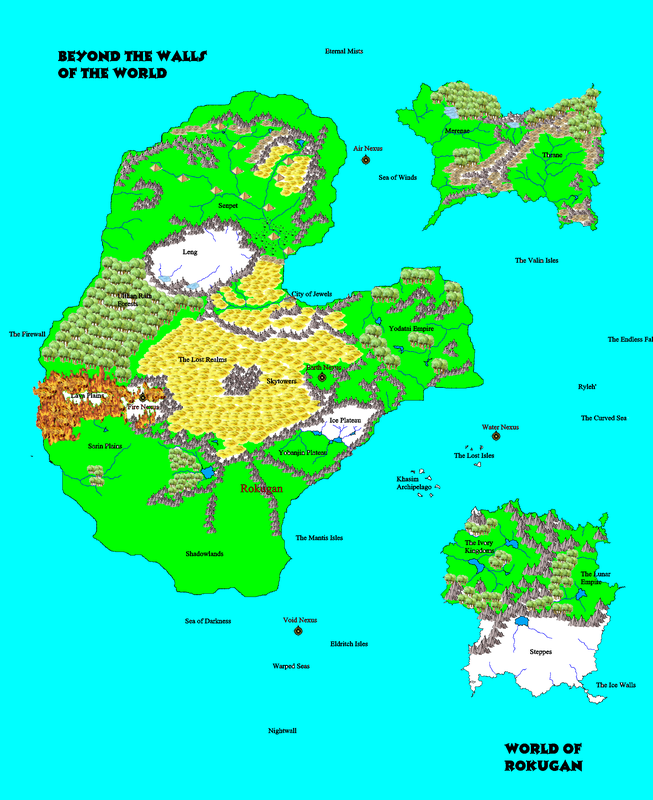 Rokugan World Map – at least the way it is in Tales of the Sunrise. Ninsei’s Musings on Political Stability. Rules for Quirks, Jason Carpenter (a sample character with two new powers), and Deathwish – an example of a power that should never be allowed. Sorcery, and how to build it. Reaction Enhancement: Biological Basics, Design-Your-Own Enhancement Systems (breaking down the standard ones), and Exotic Enhancement Systems. Technology and Magic in Fourth Edition Shadowrun: a review of sorts. Principles of the Renraku Barrier: Magic Circle Variants. On Remaining Anonymous: Just how secretive can you expect to be? One of our players Shadowrun 4 Review. Experiments in Cyberware and Elsewhere – another player article. Ninja Crosslinks: Posts on his own blogspace from our resident Ninja: Proposals for New Magical Advantages, Developments in Gamma Rays, New Cyberware to buy, making Magical Flying Saucers, Hulk Smash! (a confrontation with a Horror), Ninja Accounting, Magical Research for Mitsuhama on the Renraku Barrier, More Research on the Renraku Barrier, Magical Reflex Enhancement (a companion piece to the technological articles on Reaction Enhancement), and some Preliminary Spell Designs, Initiation Plans. Richard Mc’Andrew, Vampire – and his Acquaintances, Ether Flyer, assorted Equipment Packages (including the justly-valued Vampire Survival Pack), a new Discipline, assorted items of Special Gear, and a brief history. Vargen the Wonder Dog: A very eccentric character indeed.